With the increasing frequency of injuries and Father Time catching up to certain signal-callers in the NFL, every year sees at least a minor shift at the top of the league’s quarterback pedestal. On the flip side, sooner-than-expected bursts onto the NFL scene, as well as renaissance campaigns have further muddied the annual rankings of the best QBs. Nowhere did these factors come into play more prominently than during the 2015 regular season. One could argue that Ben Roethlisberger, Peyton Manning, Tony Romo, and Drew Brees were all among the best in the business one year ago, but a myriad of issues have stricken each of them. Furthermore, some may claim that with their recently completed stellar seasons, Andy Dalton, Carson Palmer, and Philip Rivers warrant spots on this countdown, but we have them barely on the outside looking in. 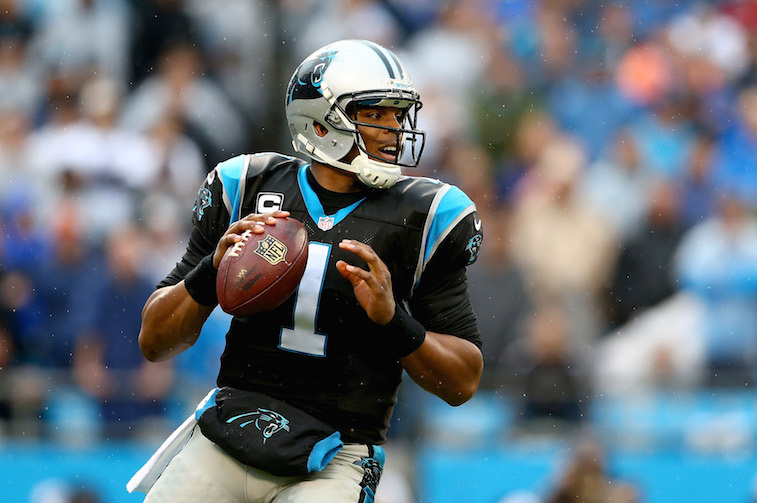 Without further ado, here are the five best quarterbacks currently in football. 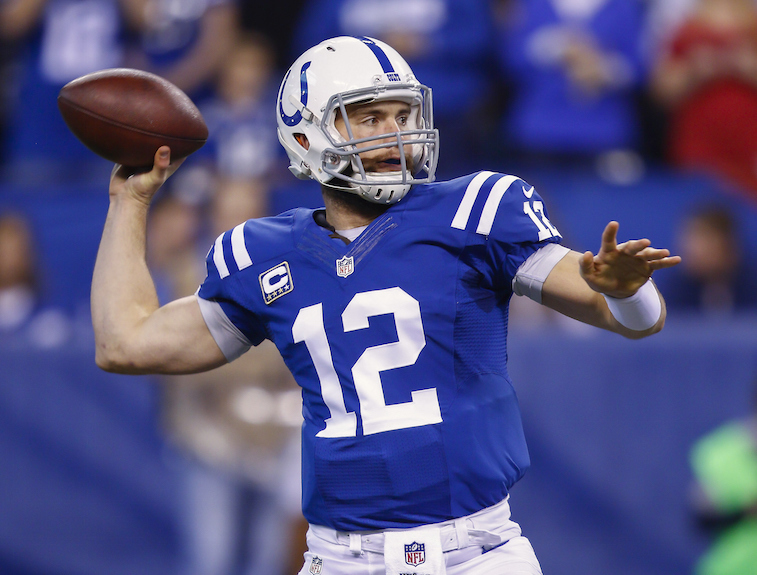 For Indianapolis Colts quarterback Andrew Luck, 2015 was a lost year, but given his track record, we expect a return to form next season. The former Stanford Cardinal is still just 26 years old and should enter the prime of his career soon. Although he played in just seven games this past season and was largely inconsistent, he battled injuries throughout. Luck is only a season removed from leading the NFL, with 40 touchdown passes, and if the Colts expect to return to the top of the AFC South, they’ll need Luck on their side. If there was an award for second-half MVP, Seattle Seahawks quarterback Russell Wilson would be the most worthy recipient. No. 3 posted a ridiculous 25:2 touchdown-to-interception ratio over the final eight contests, a stretch where he led Seattle to a 6-2 record. 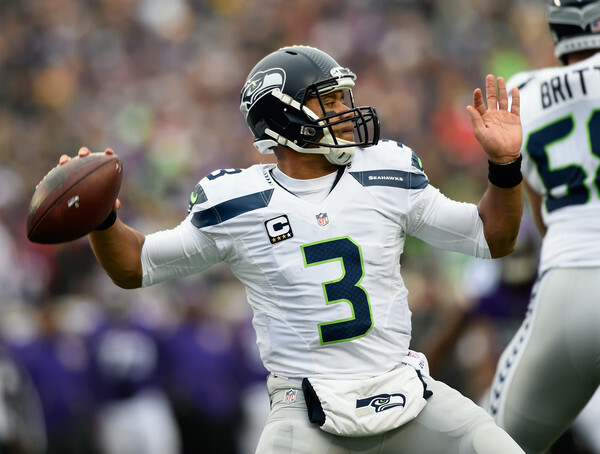 Of those final eight games, Wilson had six performances where his quarterback rating was over 100. The numbers in the first eight games? Nine touchdown passes, six interceptions, two games with a QB rating over 100, and a 4-4 mark. Wilson turned it up when it mattered the most, and his playoff experience and success at just 27 years of age clearly puts him in the top-five conversation. For a while it looked like a four-man race for this season’s MVP award. Then, Carson Palmer cooled off slightly and Andy Dalton injured his thumb late in the season, causing him to miss some games. Tom Brady stepped off the gas pedal for one second and boom, Carolina Panthers quarterback Cam Newton (unofficially) wrapped up the hardware. The best team in the league at 15-1, the Panthers also had the best QB for 2015, as his 35:10 touchdown-to-interception ratio is solid, but his rushing numbers put him over the top. The 4.8 yards per carry is just absurd and the 10 rushing scores placed him second in all of football, with the only quarterback anywhere close to him being Jameis Winston at a paltry six. Some may question us for putting Brady this high on the list, but after yet another tremendous regular season (and possible run to the Super Bowl), we believe that TB12 is easily the second-best. 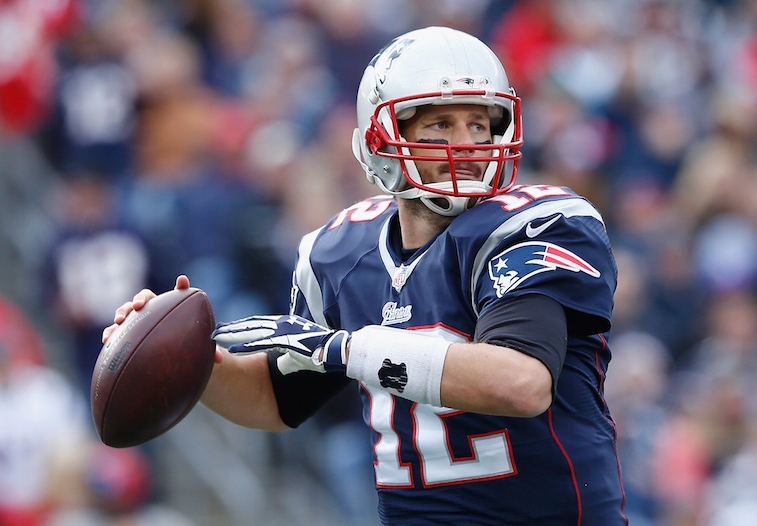 The ageless New England Patriots gunslinger is a remarkable physical specimen. At age 38 and still in the midst of his 14th complete season, Brady looked as good as ever in 2015. The “GOAT” again started all 16 games this season and led the league with 36 touchdown passes. His 1.1 interception percentage (percentage of times intercepted when attempting a pass) also paced the league. At this rate, Brady looks like he could play until he’s 45 or older. Roger Goodell probably should have known that something like this was coming as soon as he handed down Brady’s four-game suspension — which was revoked — for his possible involvement in Deflategate. If there was any doubt as to who the best QB is, then the fourth and fifth entry of this post should be the nails in the coffin. Seriously, is there any other guy who could pull off one of those Hail Mary plays, let alone two of them? 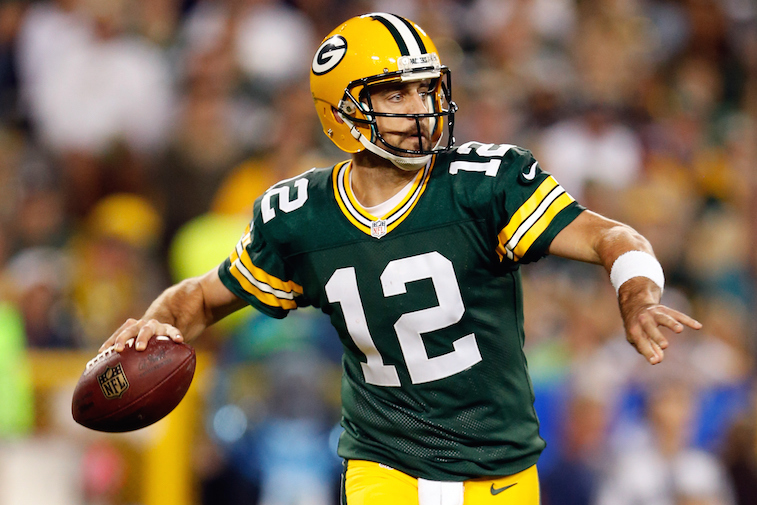 Though he won’t win his second consecutive MVP this season, Aaron Rodgers is still easily the best quarterback in the NFL today. He’s got arguably the strongest arm, displays tremendous accuracy on his passes, is a terrific decision-maker, and has above-average speed for his position. 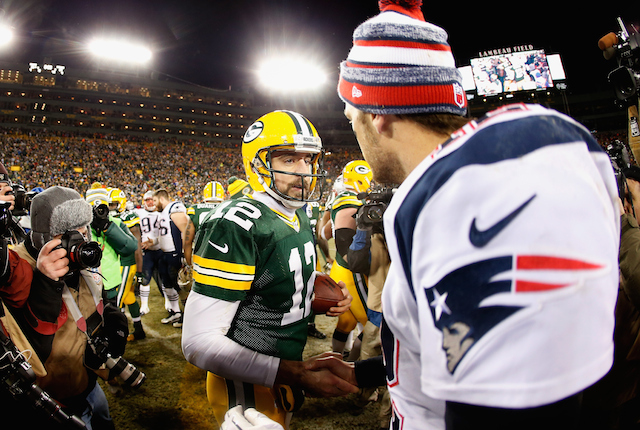 We can only hope that, at 32 years old, Rodgers continues his historic pace for years to come, much like Brady.